Emeralds are a classic example of the difficulty of accurately translating Bible words from one language (in this case, Hebrew) to another (English). 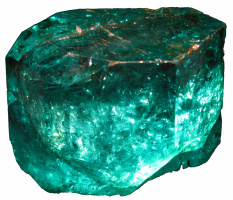 The same word translated as "carbuncle" in one translation is used to justify the word "emerald" in another. For example, the Hebrew word bareqath (Strong's Concordance #H1304) references an Emerald like gem that flashes, glitters or sparkles. The Bible lists it as one of the gemstones found in the High Priest's breastplate (Exodus 28:17, 39:10). In Exodus 28:17, bareqath is translated as "carbuncle" in the ASV, ESV, HBFV, and KJV versions of Scripture. The NKJV, HCSB, NASB, and NLT translations, however, render the same word in the same verse as "emeralds!" The widely used NIV Bible gives this Hebrew word the English designation "beryl" (emeralds are nothing more than a green variety of beryl) while the NCV lists the stone as a "yellow quartz." In Ezekiel 28:13, where bareqath is also used to designate the ninth and final stone that adorned Lucifer, it is translated "carbuncle" in the ASV, ESV and KJV, but as "emerald" in the HBFV, HCSB, NASB, NKJV, and NLT. The NIV translates the word as "beryl" while the NCV renders it "chrysolite." Even Bible commentaries disagree regarding the modern identity of the Hebrew gemstone referred to as bareqath. Some lean toward red-colored gemstones such as the red garnet, while others suggest that a more accurate translation of the word would be that of a green-colored emerald. When did the devil fall from heaven? Should Christians exchange wedding rings? In the New Testament, the fourth foundational stone in the New Jerusalem (Revelation 21:19) is referred to by the Greek word smaragdos (Strong's #G4665). Both Strong's Concordance and Thayer's lexicon define this word as referring to a green colored gem. All ten Bible translations used for comparison in this series translate this word as "emerald." After stating all of the above, a good case can still be made that the gemstone mentioned in the first row of the High Priest's is an emerald and not a carbuncle. The evidence suggests that bareqath is best rendered as "emerald" in Exodus 28:17, 39:10 and Ezekiel 28:13. In modern times, quality gemstones made from this mineral come primarily from Colombia. Anciently, this stone represented youth. The corpse of those who died young sometimes had an ring with this stone placed on their index finger as a sign that their hope in life perished early. This gem was thought to predict future events, though the mechanism through which they conveyed this information is unknown. This precious stone was also believed to improve the wearer's memory, made them wealthy, improved their thinking abilities and make them a better speaker. Rabbinic legend states that God gave King Solomon four gemstones that gave him the power to rule over all creation. One of these stones is believed to have been an emerald (Curious Lore of Precious Stones, pages 31, 76 - 79). According to the 1913 Catholic Encyclopedia article on precious gemstones, emeralds in the Middle Ages were also attributed with the ability to heal a person's eyesight. Does Satan sit on God's left hand? Where does Scripture say gold is located? Can the dead be contacted?